Mad Tower Tycoon is an amazing strategy simulation game from Egg code. 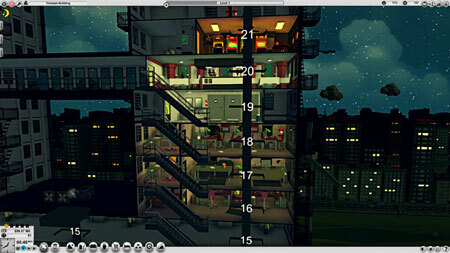 Design and build your own skyscraper with more than 100 floors. Rent offices, apartments or shops and build a financially lucrative skyscraper. Build cinemas, bars or a theater to satisfy your visitors and create an effective transport system with elevators and stairs. The elevator system allows you different settings, avoid your visitors having to climb too many stairs or wait too long for the elevator. The statistics and filters will give you a lot of information about the state of your skyscraper. Complete daily missions and have good statistics to gain experience. Earn skill points and unlock more than 50 skills. If you get stuck in the game, check out the video walkthrough and gameplay for the game. This entry was posted in PC Games, Walkthrough and tagged Mad Tower Tycoon Cheats, Mad Tower Tycoon Game, Mad Tower Tycoon Gameplay, Mad Tower Tycoon Guide, Mad Tower Tycoon Hints, Mad Tower Tycoon Review, Mad Tower Tycoon Solutions, Mad Tower Tycoon Strategy, Mad Tower Tycoon Tips, Mad Tower Tycoon Walkthrough by Marvin. Bookmark the permalink.